It was a week of despair — and hope. A week of mourning — and faith in resurrection. It was a homecoming to a home that no longer exists. A city that fell victim to an invasion of incomprehensible scale, of overwhelming numbers and laundered money. Last week I went to Vancouver, the city of my birth, the city where eons ago my grandparents first met, like tens of thousands of other European immigrants. My hope was that I would find traces of their legacy. I knew before my departure that the city had undergone massive and dramatic change in my decade long absence, that it was no longer just the gateway to Asia but a colony of Asia, and that some architectural landmarks had fallen to the wrecking ball of mass immigration and the pressure on land that follows from it. But never did I expect to see this much devastation, nor the ubiquity and predominance of Chinese migrants. No longer were they confined to the inner city and the suburb of Richmond, and other suburbs as well — including the one I grew up in. Every school ground, every sidewalk, every park, every mall was dominated by the Chinese. Not Chinese “Canadians”, but Chinese speaking Mandarin, as well as Cantonese. Their feet stand on Canada, but their heads have a different postal code. White faces, while comparably few, were not hard to spot. They stood out like light bulbs in a dark room. My grandparents and their children died decades ago, as did the grandparents and parents of White boomer Vancouverites like me. But the question was, where were their great grandchildren? They were rarely seen. No doubt some were taking refuge in their parents basements, but many more were among the White flight refugees who left the city in the vain search for a cheap home and viable employment. City politicians and realtors cited lack of supply as the culprit, but the truth is obvious. Too much demand for too little land. Developers can build up, or build out, or cram every crevice with infill housing and City Hall can give the green light to laneway housing or duplexes, but all of this is but a delaying action, a self-serving effort to kick the can further down the road. 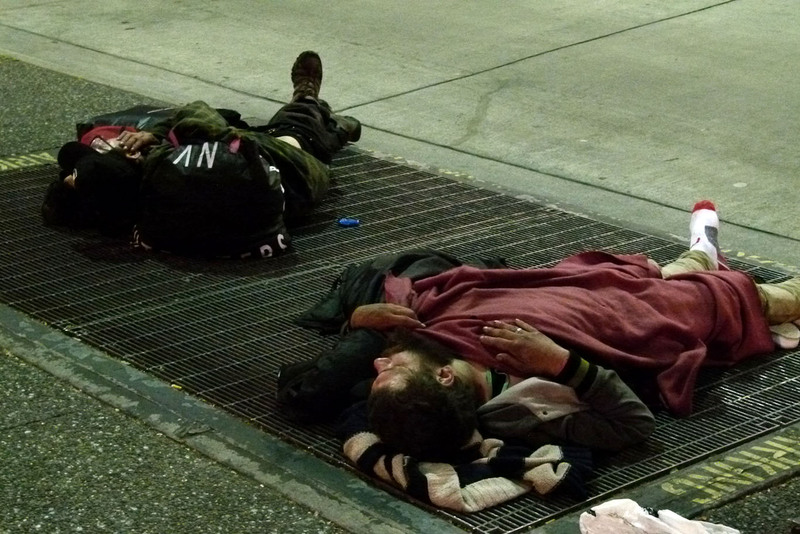 Metro Vancouver cannot sustain an annual input of 60,000 migrants or more forever. But tell a city politician that. Limits to growth? Let the next generation come to terms with it. Incredibly, some civic politicians, like Mayor-elect Kennedy Stewart, welcome the makeover. But the homeless people who adorn the sidewalks and doorways of the city core and couples looking for affordable housing have another opinion. Progressives insist that the housing crisis and the displacement of indigenous Vancouverites is purely an economic problem. The ethnicity of the displaced and those who displace them is a red herring. Irrelevant. They tell us that race is not the issue and that to make it one is to muddy the waters and provoke unnecessary division. Even those few who understand the concepts of limited carrying capacity and limits to growth are adamant that an immigration debate can only be about numbers. But they fail to understand human nature. They fail to understand that human beings are a tribal species with a territorial imperative and a built-in affinity for those most like them, and a special attachment to their family and their family writ – large—their ethny or nation. People care about their family history and their roots, and they are keen that their legacy endures. There is a reason that ancestry.com is such a roaring business. Pride in one’s civilization, ethnic or family heritage may be, in Jordan Peterson’s estimation, irrational. But we are not rational beings, nor do we want to be. Group identity is an integral part of who we are. We Westerners cherish individuality but most of us also identify with a group. We are in reality “libertarian communitarians”, notwithstanding our protestations. Most of us do not want to be captured by the Body Snatchers, or cut from our ethno-cultural moorings. We do not want to be rootless cosmopolitans or hollow global citizens of a post-national state. And neither, by the way, do the ‘displacers’, the third world migrants, who show no inclination to check their tribal mindset at the airport. Why should their tribalism be celebrated and subsidized, but ours vilified? Why the double standard? Euro-Canadian aka “White” identity is the tribalism that dare not speak its name. I am an emotional guy. The loss I felt in Vancouver was not exclusive to the architectural demolition of beloved landmarks and character homes. It was equally due to the self-evident demolition of my national culture, of my tribe, of my family and their legacy. It was as if I had returned to the cemetery where my departed ancestors and loved ones rest, only to find that it had been paved over with a shopping plaza bearing Chinese-only signage. When the twin policies of mass immigration and official multiculturalism was launched, I was told that these “New Canadians” would add another brilliant colour to our beautiful multicultural tapestry. Instead I found that along with the “addition” came the “subtraction” or erasure of what had been here before. My ethnic heirloom. I never knew how profoundly deep my sense of loss was until the second day of my Vancouver trip, when I looked out my hotel window at English Bay. It was then that I remembered seeing a photo of my grandfather wearing a body long swimsuit standing on that very beach near the turn of the 20th century. God, was it that long ago? I left the hotel a few minutes later to take a very long walk through Stanley Park, looking for places I had seen as a boy. I walked for an hour at a slow but steady pace until I reached the lawn at “Lumberman’s Arch”, about 100 metres from the shore. I stopped to survey the scene and when I did, I was beset by a flood of memories. It was at that point that a senior Dutch-born lady and her husband approached me for directions. One sentence and one topic followed another until I began to tell them about the significance of this spot. I explained that for well over a century, working class immigrants met at this place in this park for picnics. They came because it was scenic, but more than that, they came because it was free. I told them that as a boy, I heard every European language spoken here, and that for me, Stanley Park was always Berlitz Park. But when I began to talk about my own family’s picnics here, I began to choke back tears. The Dutch lady told me that it was alright. I could take my time. So I got through it. I told them that it was here that my parents, grandparents and mother’s siblings gave a send-off to my then 19 year old uncle “Al” in August of 1941. He had just come back from his 10 day honeymoon, and he was dressed in his RCAF uniform, ready to travel east to the Commonwealth Air Force Training base in Saskatchewan that very afternoon. After they all said their goodbyes, my father drove Al to the CPR railway station a mile or two away. That was the last they saw of him. Al never came back. He was killed in action three days after D-Day. But for what? So that Canada could be Chinese? So that Vancouver could be a megacity for millionaires only? Yesterday was not the first Remembrance Day that I thought of the futility of his sacrifice. About the fact that he and many of his Canadian comrades died to preserve the culture and liberties of two peoples, Canadian and British, and a bicultural nation that treasonous politicians gave away without a mandate to do so. But this Remembrance Day that feeling was compounded tenfold, for it came on the heels of a visit to a Vancouver that had been transformed well beyond my worst imaginations. A city “diversified”, densified and demolished beyond recognition. My feelings were a composite of despair and rage. I felt like doing a Charlottesville impression, marching through the streets carrying a torch and shouting “You will not replace us.” But the point is, in most of urban Canada, they already have. And they are not going to go away. Immigration-enablers, White collaborators and Asian ethnic lobbies would argue that my outpouring is the expression of an old White man steeped in racism and privilege and possessed by a feeling of entitlement. A contemptible remnant of a dying demographic soon to exit the stage. They would argue that as a descendant of White settlers who ‘stole’ native land, I have no moral right to complain about displacement or “ethnic cleansing”. As if two wrongs make a right. They would say that human history is a history of migration, of one wave displacing or replacing a previous one. They would repeat the cliché that Canada is a nation of immigrants and must continue to be so, and that immigrants built this country and are needed to continue the project. But most of all, they would parrot the party line that we are not a nation of two founding peoples, but a diverse range of people from across the world perversely united by their diversity, by their profound differences, by a set of core deracinated “values”. They would say that “old stock” Canadians of British or French descent are just fragments of a “mosaic” that can be held together by the thin glue of civic nationalism. And they would add that any prescription of “ethnic nationalism” is inherently racist and “White supremacist”, words that now seem to form part of every sentence that issues from their mouths. To them I have but one response: I don’t care what you think. I know who I am, and sorry Jordan, I am PROUD of the people I came from, as well as their unparalleled achievements. The ethic of individualism was the signature crowning glory of Western civilization, but it was always the product of relatively homogeneous people. As “The Great Replacement” continues on its rampage, it is evident that paradoxically, to rescue individualism, we must act as a collective. And to do that, we must acknowledge and celebrate our distinct identity, not deny it or apologize for it. You say you are a proud Muslim or proud African or a proud First Nations member. I dig that. But I will say that I am a proud Canadian of European descent unashamed of my white skin. Scream at me and I will only double down. I have voiced my despair, but I can’t leave it at that. I must also tell you about my hope. Before leaving Vancouver, I met ten young men with a vision, and a resolve to pursue it. They were articulate, abundant with insights, and wise beyond their years. They are Identitarians. Clean-cut, fit, strong and masculine. They have a clear idea of what they must do for themselves — and for us. It is about first developing a subculture, a counter-culture that will grow under the radar. The one that will rise like a phoenix from the ashes of a crumbling, collapsing and decadent society on course to mimic the failed states that many of its migrant citizens came from. It is about building character and following a code of conduct that will serve to act as a billboard for their message. That such a group of inspiring young men could have run the gauntlet of relentless Leftist college indoctrination with this vision and comprehensive understanding intact seems miraculous. They radiate hope. It was the antidote I needed. All is not yet lost. And to think that our meeting and our networking ultimately came about as the result of one game-changing book. Ce fut une semaine de désespoir – et d’espoir. Une semaine de deuil et de foi en la résurrection. C’était un retour dans une maison qui n’existe plus. Une ville victime d’une invasion d’envergure incompréhensible, d’un nombre écrasant et d’argent blanchi. La semaine dernière, je suis allé à Vancouver, ma ville natale, la ville où mes grands-parents se sont rencontrés il y a bien longtemps, comme des dizaines de milliers d’autres immigrants européens. J’espérais retrouver des traces de leur héritage. Je savais avant mon départ que la ville avait subi un changement important et spectaculaire en une décennie d’absence, que ce n’était plus seulement la porte de l’Asie, mais une colonie de l’Asie, et que certains points de repère architecturaux étaient tombés sous la boule de destruction d’une immigration massive et la pression sur la terre qui en découle. Mais jamais je ne m’attendais à voir autant de dévastation, ni l’omniprésence et la prédominance des migrants chinois. Ils n’étaient plus confinés au centre-ville et à la banlieue de Richmond, ainsi qu’à d’autres banlieues, y compris celle dans laquelle j’ai grandi. Chaque cour d’école, chaque trottoir, chaque parc, chaque centre commercial était dominé par les Chinois. Pas des «Canadiens» chinois, mais du mandarin parlant le chinois et du cantonais. Leurs pieds se tiennent sur le Canada, mais leurs têtes ont un code postal différent. Les visages blancs, bien que relativement peu nombreux, n’étaient pas difficiles à repérer. Ils se sont démarqués comme des ampoules dans une pièce sombre. Mes grands-parents et leurs enfants sont décédés il y a plusieurs décennies, de même que les grands-parents et les parents de baby-boomers blancs comme moi. Mais la question était, où étaient leurs arrière-petits-enfants? Ils ont été rarement vus. Certains ont sans doute trouvé refuge dans les sous-sols de leurs parents, mais beaucoup d’autres faisaient partie des réfugiés du vol blanc ayant quitté la ville à la recherche vaine d’une maison bon marché et d’un emploi viable. Les politiciens et les agents immobiliers des villes ont cité le manque d’approvisionnement comme responsable, mais la vérité est évidente. Trop de demande pour trop peu de terres. Les promoteurs peuvent construire en hauteur, élargir ou aménager chaque fissure avec des logements intercalaires et l’hôtel de ville peut donner le feu vert à des logements en rangée ou à des duplex, mais tout cela n’est qu’une action retardée et égoïste pour éviter problèmes connexes. La région métropolitaine de Vancouver ne peut soutenir une entrée annuelle de 60 000 migrants ou plus pour toujours. Mais dis ça à un politicien de la ville. Des limites à la croissance? Laissons la génération suivante en venir à bout. Incroyablement, certains politiciens municipaux, comme le maire élu, Kennedy Stewart, se félicitent de cette transformation. Mais les sans-abri qui ornent les trottoirs et les portes du centre-ville et les couples à la recherche d’un logement abordable ont un autre avis. Les progressistes insistent sur le fait que la crise du logement et le déplacement des autochtones de Vancouver sont un problème purement économique. L’ethnie des personnes déplacées et de ceux qui les déplacent est un clin d’œil. Sans importance. Ils nous disent que la race n’est pas le problème et que le faire, c’est brouiller les cartes et provoquer des divisions inutiles. Même les quelques-uns qui comprennent les concepts de capacité de charge limitée et de limitation de la croissance insistent sur le fait qu’un débat sur l’immigration ne peut porter que sur des chiffres. Mais ils ne comprennent pas la nature humaine. Ils n’arrivent pas à comprendre que les êtres humains sont une espèce tribale ayant un impératif territorial, une affinité intrinsèque pour ceux qui leur ressemblent le plus, et un attachement particulier à leur famille et l’ordonnance de leur famille – au sens large – à leur ethnie ou leur nation. Les gens se soucient de leur histoire familiale et de leurs racines, et ils souhaitent que leur héritage perdure. Il y a une raison pour que « ancetres.com » soit une entreprise en pleine ébullition. Selon Jordan Peterson, être fier de sa civilisation, de son patrimoine ethnique ou familial, peut être irrationnel. Mais nous ne sommes pas des êtres rationnels, nous ne voulons pas l’être non plus. L’identité du groupe fait partie intégrante de notre identité. Nous, occidentaux, chérissons l’individualité, mais la plupart d’entre nous s’identifions également à un groupe. Nous sommes en réalité des «communautaristes libertaires», malgré nos protestations. La plupart d’entre nous ne veulent pas être capturés par les Body Snatchers, ou coupés de nos amarres ethnoculturelles. Nous ne voulons pas être des cosmopolites sans racines ni des citoyens globaux creux d’un État post-national. Soit dit en passant, les «déplaceurs», les migrants du tiers monde, n’ont aucune intention de contrôler leur état d’esprit tribal à l’aéroport. Pourquoi leur tribalisme devrait-il être célébré et subventionné, alors que le nôtre a été vilipendé? Pourquoi le double standard? L’identité euro-canadienne dite «blanche» est le tribalisme qui n’ose pas dire son nom. Je suis un gars émotif. La perte que j’ai ressentie à Vancouver n’était pas exclusive à la démolition architecturale de monuments bien aimés et de demeures de caractère. C’était également dû à la démolition évidente de ma culture nationale, de ma tribu, de ma famille et de leur héritage. C’était comme si j’étais revenu au cimetière où reposaient mes ancêtres et leurs proches disparus, mais je me suis rendu compte qu’il avait été pavé d’une place réservée aux achats, avec une signalisation uniquement chinoise. Lors du lancement de la double politique d’immigration de masse et de multiculturalisme officiel, on m’a dit que ces «nouveaux-Canadiens» ajouteraient une autre couleur brillante à notre belle tapisserie multiculturelle. Au lieu de cela, j’ai trouvé qu’avec «l’addition», il y avait la «soustraction» ou l’effacement de ce qui était arrivé auparavant. Mon héritage ethnique. Je ne savais jamais à quel point mon sentiment de perte était profond jusqu’au deuxième jour de mon voyage à Vancouver, lorsque j’ai regardé par la fenêtre de mon hôtel à English Bay. C’est à ce moment-là que je me suis souvenu d’avoir vu une photo de mon grand-père portant un maillot de corps long se tenant debout sur cette plage, au tournant du XXe siècle. Dieu, était-ce il y a si longtemps? J’ai quitté l’hôtel quelques minutes plus tard pour faire une très longue promenade dans Stanley Park, à la recherche d’endroits que j’avais vus dans mon enfance. J’ai marché pendant une heure à un rythme lent mais régulier jusqu’à ce que j’atteigne la pelouse de «Lumberman’s Arch», à environ 100 mètres du rivage. Je me suis arrêté pour regarder la scène et quand je l’ai fait, j’étais submergé par un flot de souvenirs. C’est à ce moment-là qu’une dame âgée née aux Pays-Bas et son mari m’ont demandé conseil. Une phrase et un sujet se sont succédés jusqu’à ce que je commence à leur expliquer la signification de cet endroit. J’ai expliqué que pendant plus d’un siècle, les immigrants de la classe ouvrière se sont réunis à cet endroit dans ce parc pour des pique-niques. Ils sont venus parce que c’était pittoresque, mais plus que cela, ils sont venus parce que c’était gratuit. Je leur ai dit qu’en tant que garçon, j’entendais toutes les langues européennes parlées ici et que pour moi, Stanley Park était toujours le parc Berlitz. Mais quand j’ai commencé à parler ici des pique-niques de ma propre famille, j’ai commencé à retenir mes larmes. La dame hollandaise m’a dit que tout allait bien. Je pourrais prendre mon temps. Alors cà s’est passé. Je leur ai dit que c’était là que mes parents, mes grands-parents et les frères et sœurs de ma mère avaient accompagné mon oncle « Al » alors âgé de 19 ans en Août 1941. Il venait de rentrer de sa lune de miel de 10 jours et était vêtu de son uniforme de l’ARC, prêt à se rendre à l’est jusqu’à la base d’entraînement de la Force aérienne du Commonwealth, en Saskatchewan, cet après-midi même. Après qu’ils aient tous dit au revoir, mon père a conduit Al à la gare de chemin de fer du CP à un kilomètre ou deux. C’était la dernière fois qu’ils l’avaient vu. Al n’est jamais revenu. Il a été tué au combat trois jours après le jour J. Mais pour quoi? Pour que le Canada soit chinois? Pour que Vancouver puisse être une mégapole réservée aux millionaires seulement? Hier n’était pas le premier jour du Souvenir auquel je pensais à la futilité de son sacrifice. À propos du fait que lui et plusieurs de ses camarades canadiens sont morts pour préserver la culture et les libertés de deux peuples, canadien et britannique, et une nation biculturelle que des politiciens traîtres ont cédé sans mandat. Mais ce jour du Souvenir, ce sentiment a été décuplé, car il faisait suite à une visite à Vancouver qui avait été transformée bien au-delà de mes pires imaginations. Une ville «diversifiée», densifiée et démolie au-delà de toute reconnaissance. Mes sentiments étaient composés de désespoir et de rage. J’avais l’impression de faire une impression de Charlottesville, marchant dans les rues en portant un flambeau et en criant «Vous ne nous remplacerez pas». Mais le fait est que, dans la plupart des régions urbaines du Canada, ils l’ont déjà fait. Et ils ne vont pas partir. Des facilitateurs de l’immigration, des collaborateurs blancs et des groupes de pression ethniques asiatiques soutiendraient que mon effusion est l’expression d’un vieil homme blanc ancré dans le racisme et les privilèges et possédé par un sentiment de droit. Un reste méprisable d’une démographie mourante bientôt prête à quitter la scène. Ils diraient qu’en tant que descendant de colons blancs qui ont «volé» des terres autochtones, je n’ai aucun droit moral de me plaindre de déplacements ou de «nettoyage ethnique». Comme si deux torts faisaient un bien. Ils diraient que l’histoire humaine est une histoire de migration, d’une vague déplaçant ou remplaçant une précédente. Ils répèteraient le cliché selon lequel le Canada est un pays d’immigrants et doit continuer à l’être, et que les immigrants ont construit ce pays et sont nécessaires à la poursuite du projet. Mais avant tout, ils affirmeraient que notre parti n’est pas une nation de deux peuples fondateurs, mais un groupe diversifié de personnes du monde entier unies de manière perverse par leur diversité, par leurs différences profondes, par un ensemble de «valeurs» essentielles déracinées. Ils diraient que les «vieux» Canadiens d’origine britannique ou française ne sont que des fragments d’une “mosaïque” qui peuvent être maintenues ensemble par la fine colle du nationalisme civique. Et ils ajouteraient que toute prescription de «nationalisme ethnique» est intrinsèquement raciste et «suprémaciste blanche», des mots qui semblent maintenant faire partie de chaque phrase qui sort de leur bouche. Pour eux, je n’ai qu’une réponse: je me fiche de ce que vous pensez. Je sais qui je suis et désolé Jordan, je suis FIER des gens d’où je viens, ainsi que de leurs réalisations sans précédent. L’éthique de l’individualisme était la signature de la civilisation occidentale, mais c’était toujours le produit de peuples relativement homogènes. Alors que «Le Grand Remplacement» continue de se déchaîner, il est évident que, paradoxalement, pour sauver l’individualisme, nous devons agir en tant que collectif. Et pour faire cela, nous devons reconnaître et célébrer notre identité distincte, non pas la nier ni en présenter des excuses. Vous dites que vous êtes un fier musulman ou africain fier ou un fier membre des Premières Nations. Je comprend ça. Mais je dirai que je suis un fier Canadien d’ascendance européenne sans honte de ma peau blanche. Crie moi dessus et je ne ferai que doubler. J’ai exprimé mon désespoir, mais je ne peux pas en rester là. Je dois aussi vous parler de mon espoir. Avant de quitter Vancouver, j’ai rencontré dix jeunes hommes qui avaient une vision et la détermination de la poursuivre. Ils étaient articulés, riches en idées et sages au-delà de leurs années. Ils sont identitaires. Coupe nette, en forme, fort et masculin. Ils ont une idée claire de ce qu’ils doivent faire pour eux-mêmes – et pour nous. Il s’agit d’abord de développer une sous-culture, une contre-culture qui passera inaperçue. Celle qui sortira comme un phénix des cendres d’une société en ruine, en train de s’effondrer et de devenir décadente, sur le point de mimer les États en faillite dont sont originaires nombre de ses citoyens migrants. Il s’agit de construire le caractère et de suivre un code de conduite qui servira de panneau d’affichage pour leur message. Qu’un tel groupe de jeunes hommes inspirants aurait pu relever le défi de l’endoctrinement implacable des universités de gauche avec cette vision et une compréhension globale intactes semble miraculeux. Ils rayonnent d’espoir. C’était l’antidote dont j’avais besoin. Tout n’est pas encore perdu. Et dire que notre réunion et notre mise en réseau sont finalement le fruit d’un livre qui a changé la donne.